While I am sure we all want a kitchen that envies Tyler Florence's (*gasp*), I - like most of you - don't have the square footage or...ahem....the exorbitant wad of cash in my wallet to warrant such a luxurious place to rustle up some grub. Alas, we can't all be rock star chefs with TV shows and magazines to foot the bill for dream kitchens. 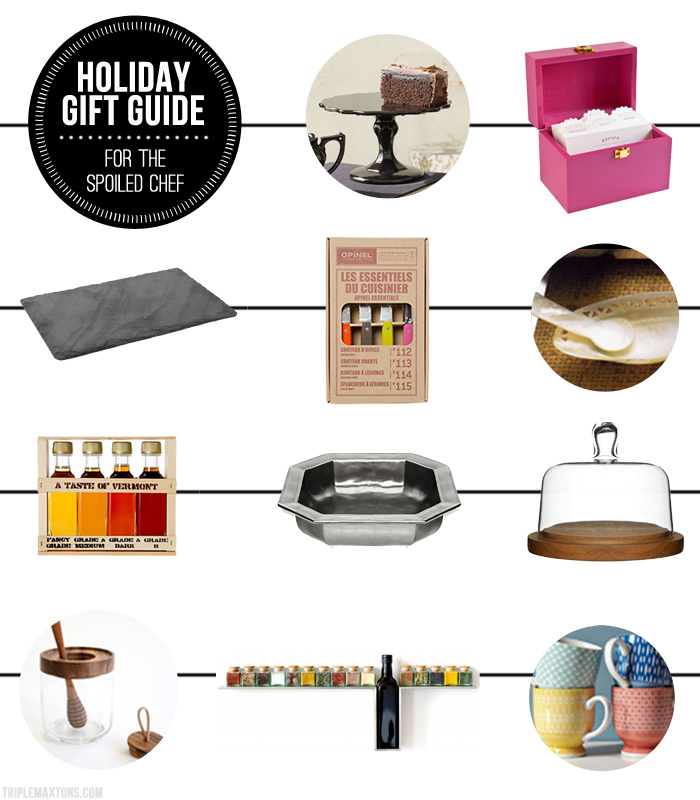 Instead, we can spoil our foodie family members and master chef friends with the lovely and luxurious kitchen accessories featured in this year's holiday gift guide for the spoiled chef! Rosanna Rococo Noir Small Cake Pedestal - Like a better-than-basic black dress, the Rococo Noir Cake Pedestal makes a striking statement when laden with cakes or hors d'oeuvres. Gold Label Recipe Box - This gold label recipe box is crafted using raspberry lacquer and houses 100 recipe cards divided in six categories: breakfast, lunch, dinner, starters, sweets... and family recipes. Slate Cheese Board - A rustic slate serving board that does double duty, giving hostesses the ability to scribble on the types of artisinal cheeses that you will undoubtedly be gobbling up. Calories shmalories. Opinel Knife Set - With a peeler and paring, serrated, and vegetable knives, this collection is ideal for preparing produce and trimming meats. Clean and colorful mid-century design inspires this set of kitchen knives. Roost Mother-of-Pearl Condiment Bowl and Spoon Set - Seriously, how decadent is this latticed pearl bowl? It's a bowl worthy of an impromptu wine-and-caviar picnic on the top of the Eiffel Tower. Maple Syrup Sampler - Taste the subtle nuances that distinguish this favorite Vermont treat, from the strong and dark "Grade B", to the mild and delicate "Fancy Grade". I mean, really, this had me at "Fancy Grade" syrup (with caps no less). Who knew that even existed until now. Juliska "Pewter" Square Baking Dish - This "pewter" baking dish is actually stoneware with a rich, old-world luster that summons up visions of grand European estates. Ha....fooled you didn't I?! Oak Cheese Dome by Sagaform* - Ok, so this went on the list not because it is for cheese (you must think I really love cheese). I put this on here because it is smaller and covered with glass....the perfect way to tease and tantalize your host with homemade truffles placed inside. Honey Jar + Stick - This eco-friendly honey jar and stick is unique, beautiful and creates less sticky mess. Say no more. 1-Line Spice Rack - Constructed from 1/4" thick brushed stainless steel bars, this spice rack appears to float on the wall for easy and organized access. Bonus? Each spice rack comes with 13 glass mini cube bottles with cork tops. Modernist Mugs by West Elm - Made in Japan using special printing techniques, these petite, brightly patterned mugs give your coffee or tea a colorful jolt. The fun, whimsical motifs take their cue from retro 1950s diner prints. 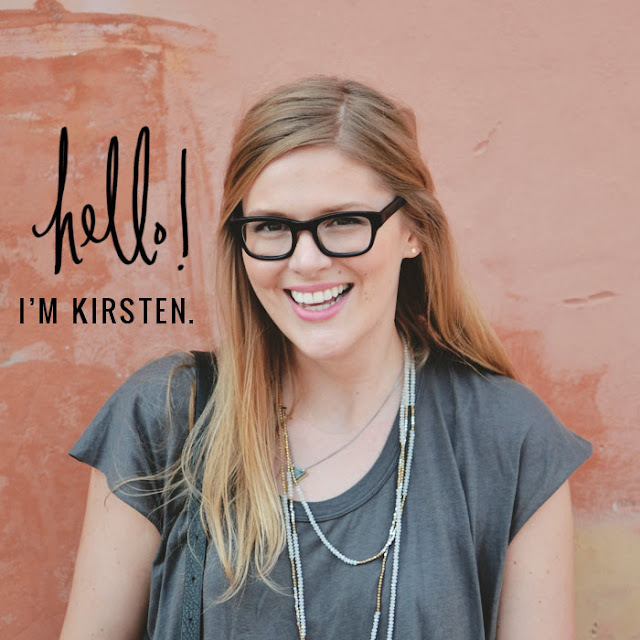 Loving these gift guides! Thanks for posting. Lots of stuff I haven't seen everywhere already. An other cute selection :). Thanks you two! So happy that you have enjoyed the guides!